The Cool House: Maintenance, Renovation or Total Remodel? Maintenance, Renovation or Total Remodel? When you're rehabing a house how do you know whether a project is renovation or just simply maintenance? For example, that vanity unit we had to replace in the downstairs bath this spring. Was that maintenance? The thing had de-laminated completely. What about the faucet? It was leaking and we couldn't fix it. If we'd simply bought another a part I'm pretty sure that would be classified as maintenance but replacing it with a new one? What category does that fall into? Right now I'm looking at the redwood siding between the kitchen slider and the slate patio step and it's in pretty sorry condition. 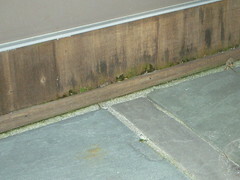 The rainwater gets splashed up against the siding and has caused the redwood to look a little moth-eaten. It definitely needs some maintenance. The question really is: what should we do about it? The other sliders off the living room have had their redwood footers replaced with the same bluestone as the terrace on that side of the house. This would seem to be the most sensible solution, effectively solving the problem once and for all. However, these doors are (hopefully) going to remain in situ and ideally I would like to remove the kitchen slider, a replacement that was put in neither straight nor true, (and with interior molding that doesn't match any other in the house) with a better model. Unfortunately, the slider is only a few years old and would not be cheap to replace. It would also be better to leave any replacement doors and windows in this room until we get the kitchen updated, to go for one major upheaval, rather than making two lots of mess. In short, I don't want to replace the rotted siding with slate only to have to knock it off again in a year or so. The only answer I've been able to come up with so far would be to replace the thin cedar molding by the step with a 4" version, and hope that withstands this winter's rain, ice and snow. I'm a little afraid though, that, as often happens in this family, the temporary fix will turn into a permanent solution. My problem is that we would be doing maintenance on what I think requires renovation, if not a total remodel.